Gujari Mahal is a palace inside the Gwalior Fort at Gwalior. This palace is at a lower region near the base of the fort. It was built by Tomar ruler Man Singh in 1486-1516 for his queen Mrignayani. Rectangular in shape, it measures 71m x 60m. There is a courtyard surrounded by 28 rectangular rooms. On all four corners there are cenotaphs. Entire palace is decorated with color tiles. In 1920, the palace is converted int0 a museum. The galleries of the museum display the archeological heritage of the period from B.C. to 17th A.D. The exhibits include stone idols, bronze idols, inscriptions, miniature paintings, terracotta figures, coins and arms and armories. Timing of this museum is from 10.00 am to 5.00 pm daily except Monday. Spectacular photo...where was it clicked from? very informative site...way to go! Thank you for your visit on my post about my life in Indonesia. Thank you also for your kind words. Your post about the Gwalior Fort is interesting and I always wonder how those buildings are always in such good conditions. Wow! Spectacular picture! Looks awesome! Hi Rajesh! March has arrived and maybe this awful winter will be gone... Happy Holi. Great Festival of Colours!! Superb. 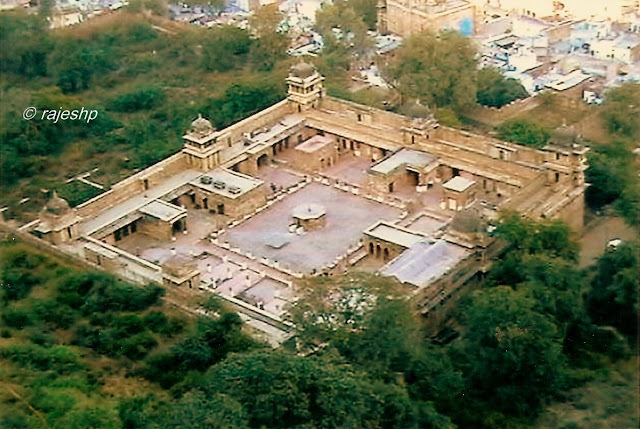 From where did you shoot this aerial view of the Gujari Mahal? That looks like an enormous palace. Great that it's a museum and people can go see the exhibits which sound fascinating. Marvelous capture of another gorgeous place in your world. How I would love to visit there! Have a great week, Rajesh! that is a must see, i hope you will feature the museum next time. btw, is the museum free? that is such a beautiful structure. i always think when i read your posts that if i ever get to india, i could tour all over following your posts. i would love to see all of it. Rajesh: It is just amazing to me living in the New World to here these dates. What a wonderful structure and it really needs to be preserved. Lovely gift for a queen! Just beautiful. This looks like a wonderful palace-museum. Your picture is is superb. A very well preserved architecture. Great aerial shot! this is beautiful! where did u get such a vantage point??? Such an impressive building. Great post again. Actually this looks like a fort as well - seems ready to be defended. What a pretty place. Gujari Mahal is a palace, This is looking very great and location is very awesome. what is price of this mahal. It's wonderful that such an edifice continues to exist as a museum. The public benefits; even some of us (like me) who haven't visited India yet are enjoying the sight. I would love to see the interiors. That is a beautiful palace/museum. It looks like it's next to a forest or jungle. What a wonderful view of the museum. It looks like you were standing on a mountain side when you took it. Beautiful again, and so interesting ! I have a roundtrip through India on my travel list, lol ! what a view you have captured! huge and surely ornate like so many Indian dwellings! great shot of the palace, it looks very impressive and its nice that its now a museum so everyone can enjoy the lovely place. Such a beautiful palace. It is so big. Great shot! What a pity it's so far away! I'd love to visit. A wonderful shot from above, as clear as an elevation drawing. A wonderfully well preserved fort. What a spectacular building! And a nice aerial shot, too. I've always felt I'd love to live in a place like that, with it's own courtyard. Gorgeous! And I'm GRATEFUL for the history lesson as well. Nalini, Tarun, Celine, Anu: Thanks, the snap was taken from the top portion of the fort. After crossing Man Mandir Palace and Juhar Kund, one can reach a spot from where one get to see this view. Reader, Fishing Guy: Thanks, this fort is very huge. Yet some of the monuments have been maintained pretty well. Sandeep, Rakesh, Anya, Joe, Maryt, Dirk, Laura, Sandy, George, Ebie, Vicky, LadyFi, Cybele, Wolynski, Tony: Thanks for the appreciation. Protege, Indrani: Thanks. Unfortunately we were in Gwalior on Monday. Since it is closed we had to give it a miss. Trotter, Sylvia, Gattina, Rinkly: Thanks, you will really like it. Jeevan, Bhavesh, Pat, Pam, Joshi, Suman, Tammie, Eden, Magiceye, Arija, Jay, Roger: Thanks for the appreciation. Carver, Hazel, Glennis: Thanks, that way it will be maintained well also. Photo Cache: Thanks. Unfortunately we were in Gwalior on Monday. Since it is closed we had to give it a miss. Entry museum is not free. I liked the way you captured the mahal. Gr8 info and a gr8 pic! Did you capture the pic? How did you manage the aerial view? Deepazartz: Thanks, the snap was taken from the top portion of the fort. After crossing Man Mandir Palace and Juhar Kund, one can reach a spot from where one get to see this view.